Visitors to Salisbury Mansion will see household furnishings and decorative arts that range from early 18th century Queen Anne to 1820s Boston Classical. Unlike today, cabinetmaking was a craft and furniture was custom made. There was no browsing through the isles of Pottery Barn or Ikea! Perhaps the most stunning piece on exhibit is Stephen Salisbury’s standing desk, purchased from a Boston cabinetmaker in 1772. In style it is high-end Chippendale, with a serpentine front and bold brasses – designed in every way to impress. 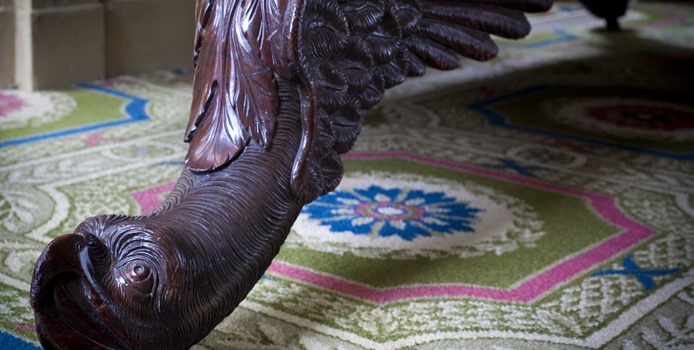 Also eye-catching is the heavy Boston Classical sofa with falcon heads embellishing the front legs, part of a suite of furniture purchased from Isaac Vose & Son of Boston in 1820. Other Salisbury pieces include a set of Vose chairs, an 18th century harp, two 19th century sofas, and ceramics. Salisbury possessions are complemented by artifacts representative of the furniture listed in an 1851 inventory of household goods, written by Stephen Salisbury II prior to selling them at a public auction after the death of his mother, Elizabeth Tuckerman Salisbury.